Gazing out to the lagoon from the Melaluca Safari tent at Tanja Lagoon Camp. Photo: Supplied. Tanja Lagoon Camp is a luxurious bush haven deep in the Mimosa Rocks National Park. Hosts Loz and Sam are true eco-warriors, they love this property and the surrounding area, which comes across in their care for it. 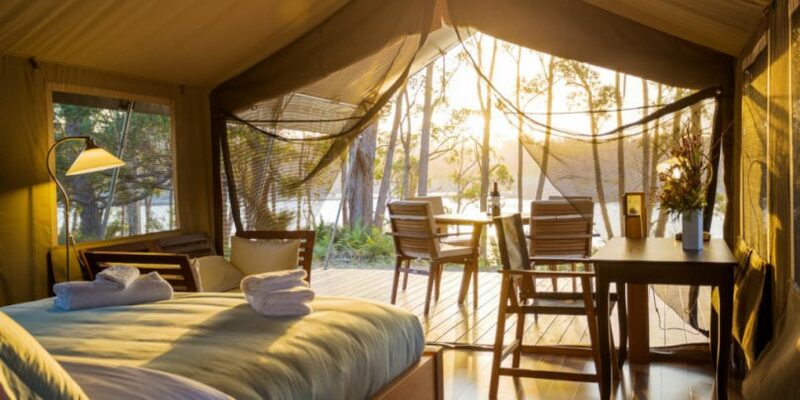 The safari style tents are large, and sit up off the ground on raised timber platforms, they offer beautiful views and privacy, comfortable beds and en-suites. Each tent overlooks the calm Tanja Lagoon, the whole ambiance encourages you to relax and slow down, stop, listen and watch. There are canoes for you to take out onto the lagoon and float around with the swans, or explore waterways further down towards Middle Beach where you can walk along the sandbar and catch a wave. Immersed in the nature all around you, hours and days can be spent bird watching, swimming, and bush-walking. Coots and spoonbills, swamp wallabies, kangaroos, and gliders abound. An Eastern Grey Kangaroo sends ripples through the serenity at Tanja Lagoon Camp. Photo: Lisa Herbert. If you feel like exploring the area (if you can drag yourself away from the peace of TLC) you can follow a high-quality art trail-loop of your own making – Tanja Open Studio, Ivy Hill Gallery, Narek Gallery Bermagui, Bega Regional Gallery, and Spiral Galleries, Have some coffee with your art and crafts at The Wharf, Tathra. There is the beach, and there is this! Tathra Beachside. Photo: Lisa Herbert. 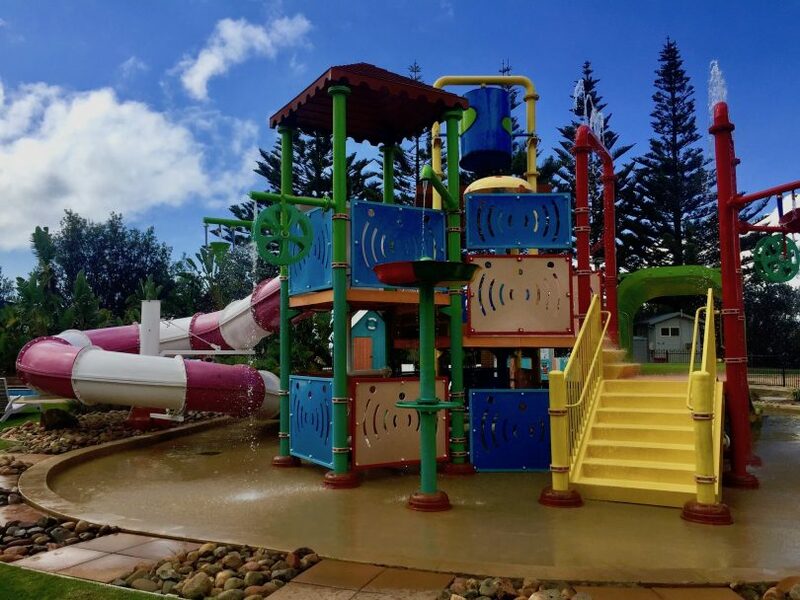 Tathra’s multi award winning holiday park boasts over 500 metres of absolute beach frontage, in this pretty seaside town on the Sapphire Coast. This stretch of coast has been recognised as Australia’s Coastal Wilderness for its unspoilt landscape and absence of crowds. Tathra Beachside offers guests a truly diverse range of accommodation from luxury three bedroom beach houses to shady, grassy camp sites, vintage vans, glamping and everything in between. They’re pretty much booked up for sites on the Easter weekend, but have other accommodation available before and after. Over Easter, Beachside are planning some great family activities like concerts with Frankie J Holden, Easter Egg Hunts, birdwatching talks and demonstrations and more. 50kms of mountain bike trails at Tathra. Photo: Tathra Beach & Bike. The local network of trails is flowy, fun and exciting for riders of all levels and there is an MTB skills park at the Tathra Country Club. Tathra Beach and Bike also hire Stand Up Paddle boards and will point learners to the southern end of Tathra Beach, in the waters of the Bega River to have a go. Aaron and his staff are very knowledgable and will get you going. There’s plenty of fishing too, walking out to the beautiful historic wharf where you can chat to the locals, catch squid, and have a delicious coffee or lunch. At night time there are clubs, and the renovated Tathra Hotel, where they have a great menu, and free live music on weekends, and all over the Easter public holidays. Looking across the waters to the south Tuross Head. Photo: Lisa Herbert. 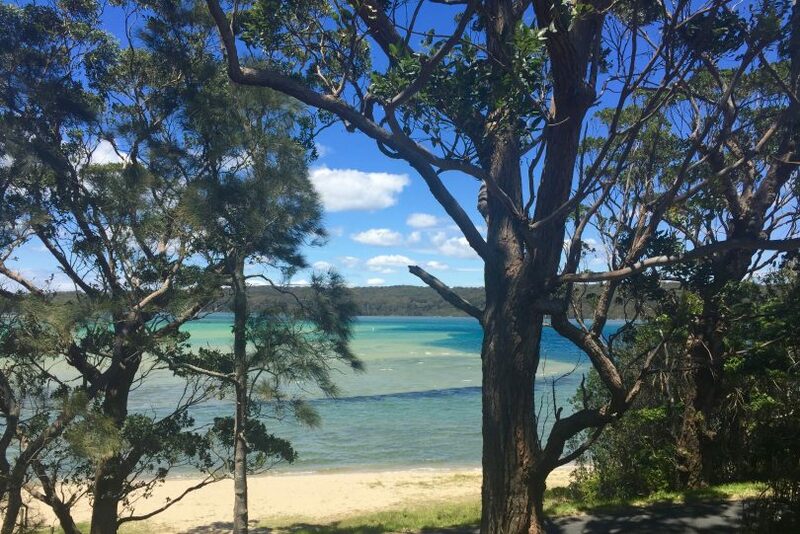 Down the end of a bush road, backing on to Eurobodalla National Park and teeming with wildlife, Beachcomber is a true mix of beach and bush. Here you can watch sunsets over the bay, make your own wood-fired pizzas, and sometimes catch an emu wandering around, and of course, explore the nearby walking tracks. A very peaceful stay for the whole family in a great location. There are powered sites, tent sites, and some cabins, most with ocean views. While you’re in the area, head to Bodalla for an outing and eat cheese at the Bodalla Dairy Shed or visit the excellent Downward Dog Café. Lake Jindabyne. Photo: Tourism Snowy Mountains. Don’t feel like heading to the ocean? Well then, the Snowy Mountains it is! There’s a lot to see and do during April. The 2019 Easter School Holiday Adventures Festival at Thredbo looks pretty amazing – trampolining, hiking, live music, craft workshops, disc golf, mountain biking, Easter egg hunts, nature bingo, giant chess games, basket and mask making and even family yoga. Check out the full program here. Cabramurra, and the Three Mile Dam. 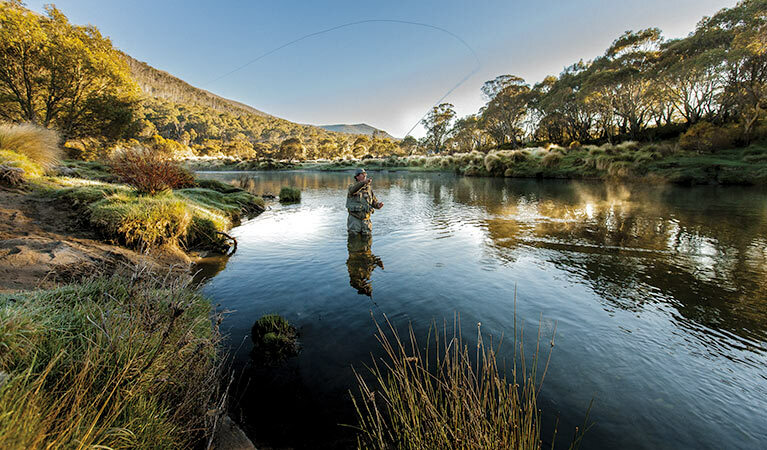 The crystal clear waters of the Thredbo River, near Thredbo Diggings campground, are perfect for fishing. Photo: NPWS. You want mountain views, a river setting, and a peaceful spot among the snow gums? 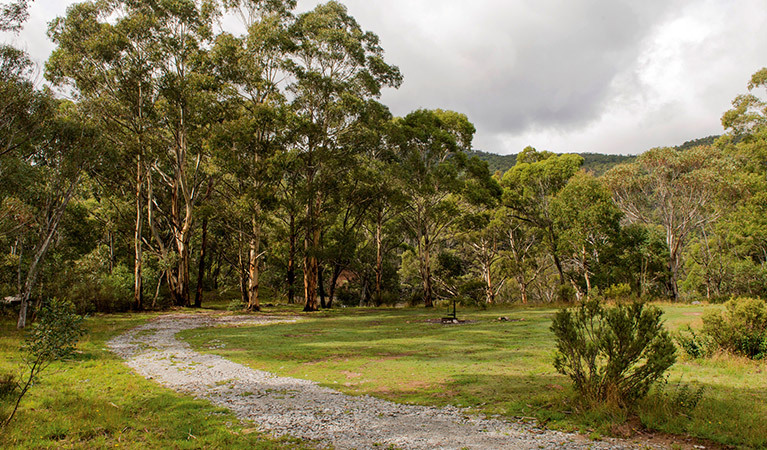 Thredbo Diggings Campground is definitely the site for you. During summer, lots of families and fishermen enjoy this place by the Thredbo River. For mountain bikers, the Thredbo Valley track passes right by or walk the riverside Bullocks track, cooling off in the in the icy water along the way, you could also try to hook a Brown or Rainbow Trout with a spot of fly fishing. This quiet campground offers plenty of space for families and solo travellers. Set up camp down by the Snowy River or opt for a flat site up the hill, where there was once a major community involved in the mighty Snowy Mountains Scheme. Bring your canoe or lilo and spend a relaxing afternoon paddling the clear waters. 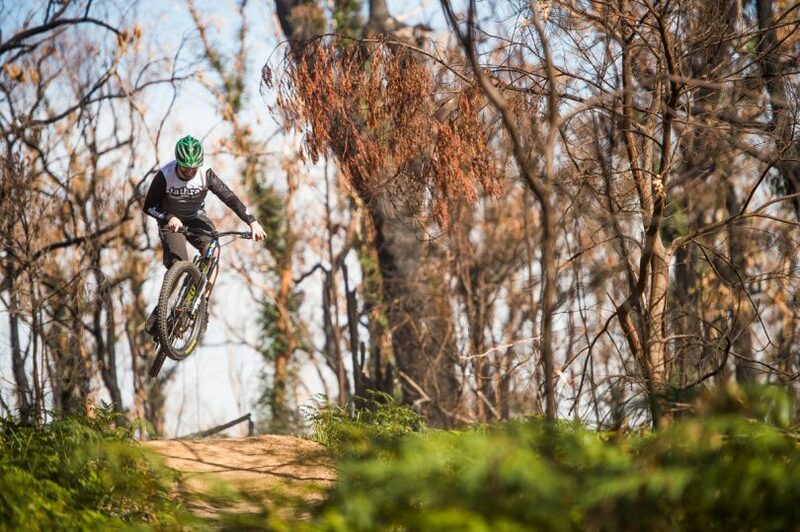 Throw a fishing line in, or give your legs a workout on the alpine mountain bike trails. If you don’t feel like camping, Thredbo YHA provides great value accommodation at the literal foot of the mountain. Forget shuttling into the village or over-priced accommodation and book yourself into our comfy, cozy and super-well equipped home away from home. Assess the conditions from the sunny balcony over your morning coffee and chat the night away around the firepit. Please note, no parking is available at Thredbo YHA. See the Thredbo Village Map for designated parking areas. Island Bend Campground – a quiet campground by the Snowy River. Photo: NPWS. Editors note: Lisa Herbert pays her own expenses. Reviews are honest and not based on a commercial relationship.